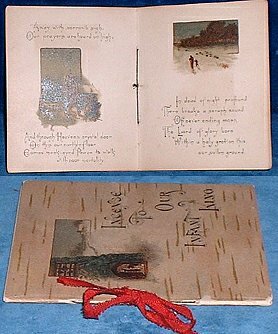 Description: Munich & New York, Obpacher Brothers 1890s) Chromoliths (6 + both covers each different). . 125x100mm card covers spine with gold colored metalic thread and with red silk bow All Edges Silvered. Book made of 8 card leaves each opening having a chromolith and a verse in decorative calligraphic script. Very similar to those printed by Nister or Castell for the gift market.